If you live in the Atlanta area, here’s an upcoming event you may not want to miss. 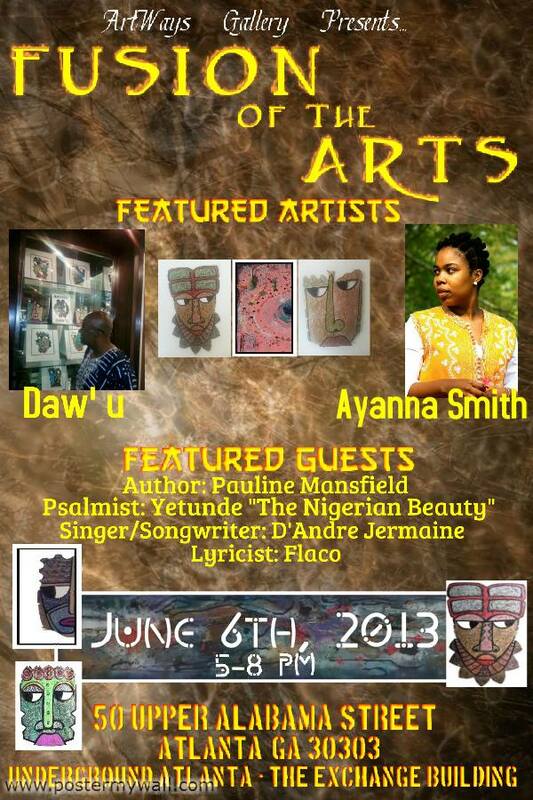 On June 6, 2013 Artways Gallery Presents: Fusion of The Arts (see flyer above). One of the features guests is a friend. Her name is Pauline Mansfield. She is the author of The Turtle Story (about domestic violence), and The Chess King. She’ll have both of those available for purchase. The event will be held at 50 Upper Alabama St. Atlanta, GA 30303 (Underground Atlanta) from 5:00 PM until 8:00PM. Tyler Perry’s “Love Thy Neighbor” was hilarious! Mama Hattie, the star of this comedy, delivered line after funny line. Sure, she can stand toe to toe with Madea but she is truly no match for Madea. If you didn’t get a chance to watch the premier of this show on OWN, I’m certain they’ll be running it again soon. On a scaIe of 1 to5 with 5 being the best, I’m giving this one 4.5 out of 5. Last night I watched as Tyler Perry and Oprah rolled out the first of two new shows that Tyler Perry has produced for the Oprah Winfrey Network. The first show was called “The Haves and Have Nots. This show started a bit slow but it definitely reeled me in. Two episodes ran back to back thereby giving the audience a chance to bond with the characters. It was very enjoyable and I can’t wait until the next episode. Tonight is the premier of the show “Love Thy Neighbor”, a comedy. Take a look at the trailer above. Seems like this one is going to be hilarious. The main character, Hattie Mae, is Madea’s mother. Tomorrow, I’ll let you know what I think about this one as well. Too many times in life, the same thing that we like, we dislike the same thing. Let me give you an example. A woman meets a very muscular man. She brags to her friends about how great a body he has. They ultimately get married. She then complains to her friends that her husband spends too much time at the gym. How does she think he got the body that she loves so dearly? Sometimes people are too funny and don’t really know what they want. I brought all of this up to talk about the video above. Here’s the set-up: A white gentleman went to Wal-Mart with his 3 small daughters. The daughters are biracial and have dark features. The gentleman and the kids were in Wal-Mart for only a short period of time but he spent considerable time putting the seat belts on his kids in the parking lot. A concerned citizen reported to Wal-Mart Security that this was an odd looking situation and that perhaps he had kidnapped the kids. Security contacted the police who in turn went to the house and found the Caucasian gentleman and his African-American wife. The police questioned them and determined that the kids belonged to them. The parents are very angry about the situation. What if the kids had been abducted and they were out in plain view and no one said anything? The wife’s complaint would now be totally different. What harm was done? I remember going to Ticketmaster to buy tickets. I attempted to charge the tickets and was asked to provide identification (which I had left at home). I told the agent that I would return. By the time I got home the credit card company called to ask if someone had stolen my card. They, just like the concerned citizen, were taking precautions because something looked a bit suspicious. Perhaps we all should question more things. Check out the video. I am looking forward to TYLER PERRY’S new show on OWN tonight called THE HAVES AND HAVE NOTS. I have seen the trailer for this show and I think it ought to be great. I watched Tyler Perry being interviewed by Oprah on her Oprah’s Next Chapter this past Saturday. This man is awesome. He has produced two shows for OWN and as I indicated, the first one begins tonight. I’ll let you know tomorrow if I’m still impressed. Check it out for yourself and let me know what you think. See the trailer above. I think the show comes on at 9 pm on OWN. Check your local listings. As a tribute to those who have lost their lives defending this country, AMERICA, I am posting this video of one of the greatest voices of our time singing the most memorable version of THE STAR SPANGLED BANNER that I’ve ever heard. Whitney Houston first sang her flawless version of our National Anthem before Super Bowl XXV on Jan. 27, 1991 in Tampa, Florida. In the video above, Whitney sings her heart out for the troops live at her 1991 “Welcome Home Heroes” concert in Norfolk, Virginia, USA. In her memory and in the memory of those whose blood has been shed to defend our freedoms, I leave you with this post. This is a site that can help you with everything from vocabulary to chemistry. Correct answers help to get free rice donations made to the World Food Programme to help end hunger. You’ve definitely got to check this one out and pass it on. Ok, it’s Memorial Day Weekend and some people have scheduled travel, a barbeque, a golf outing, etc. Though all of these activities are a great way to relax over this typically long weekend, many tend to forget or not even know what this day is all about. 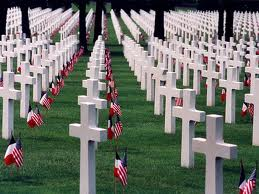 Memorial Day is celebrated on the last Monday in May, on which those who died in active military service are remembered. DON’T DRINK AND DRIVE!!! As they say, the life you save, may be your own. Last year, news sources ran rampant reporting that Michael Jackson’s baby sister Janet had married a billionaire. Little did they know that Janet was stacking her own money and sources are now reporting, that Janet has joined the ranks of other notable celebrities such as Oprah Winfrey and Stephen Spielberg. Janet is now a billionaire. I have seen Janet in concert approximately five times and she definitely gives you a great show. I remember when she first came out with Rhythm Nation, I went stir crazy and didn’t listen to much else for two years. In this undated video clip above, she addresses domestic abuse. I recently posted an article about domestic violence which featured a book by a friend named Pauline Mansfield called the Turtle Story. Check out Janet as she addresses this issue that is still so prevalent in this world. I had to post this video. This is a case when man’s best friend becomes a woman’s worst nightmare. Watch as this dog is accidentally let out as the bride makes her way across the lawn to get married.